Whether it's crisp electronic beats, heavy dancefloor riddims or simulated acoustic drums you're after, Ultrabeat can do it all. It's a fully capable rhythm workstation that can create, manage and mash up patterns of synthesized or sampled drums. Yet although many use its presets or load up the odd sample, few explore its full potential. 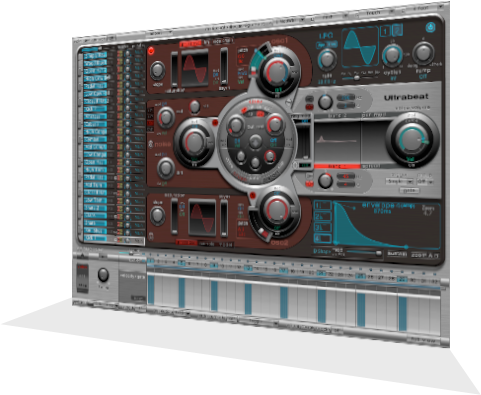 Ultrabeat can create unique sounds from scratch, emulate classic drum machines, and morph them dynamically across complex patterns. These tutorials are discontinued, and are now free. The first video from part 2 of the tutorials, explaining why drum synthesis is worthwhile. Part 1 explains Ultrabeat's layout and how all its features work, from pattern creation to synthesis. Although Ultrabeat can seem intimidating, these videos break it down into simple chunks, and you'll find it quick, easy and fun to edit and create your own sounds. Part 2 delves into the exciting world of synthesising your own drum and percussion sounds. You'll learn everything from how to recreate classic 808 sounds to making far out and unusual electronic percussion. We'll also be exploring Ultrabeat's rarely used sound morphing capabilities. You can see the full list of chapters and video titles in the section below. Why is synthesizing your own drums worth the effort, when there are so many good sample packs out there? Firstly, it's fun and very satisfying to know that you created your own original drum sounds that nobody else has access to. Secondly, synthesis gives you a huge range of options that samples don't — you can build your drums to fit your track perfectly, and once you've done that, you can morph parameters of the sound in realtime, something that's impossible with samples. Ultrabeat ships with Logic and Logic Express as a native synth, and it's an extremely powerful tool. Not only does it offer a huge array of options for creating all manner of percussion hits, it sounds fantastic too, and is capable of making sounds to rival the old-school analogue drum machines that are so well loved in electronic music. In short, Ultrabeat is your one-stop shop for creation of customised, flexible and complex rhythm tracks. This module takes a look at the overall layout of Ultrabeat, and all of the features on its faceplate, including pattern creation and editing, live performance, the synthesiser section, and sampling sounds. Here we learn how to make a multitude of electronic drum & percussion sounds. As well as learning about specific sounds, we'll also explore the fundamentals of drum synthesis, allowing you to make your own weird and wonderful sounds however you like. Finally, we'll look at Ultrabeat's ability to morph percussion sounds and its use as a normal (i.e. tuned) synth. Using Ultrabeat as a normal synth. Your tutorials are awesome, they're some of the best Logic – no, actually some of the best production tutorials in general, I have encountered so far. The tutorials are presented in an easy to follow and logical fashion. They go into just enough depth without being confusing or too verbose. The information provided helped me get a better understanding of how to get in and start making my own custom sounds. I'd also like to mention that the support you offered me as an end-user was stellar! Hey, great tutorials, seriously! The quality is good, the content is good, and I really appreciated your professional yet casual presentation. I was on the fence about buying them because I'm already fairly familiar with ES2 and synthesis, but the price was good so figured the last set would be worth it alone. Turns out I picked up a lot of new tidbits from the first two parts, and the last group was even better than I expected. Just like to say the tutorials are great and easily worth the money. I love the fact they are HD and you are so clear and concise which makes for being a great teacher.